Washing is one of those household tasks you can’t escape no matter how much you try. Fortunately, laundry has been made much easier by modern washing machines. Regardless of their technology, size or price, these buddies come in handy when you want your fabrics clean, whiter and dry. Well, to be honest, choosing the best portable washing machine doesn’t require your expertise in analyzing specifications and prices. With the daunting array of washing machine models out there, and claiming to do this and that in the market, laying your hands on the best unit is not always guaranteed. Fortunately, we have compiled a list of the most outstanding Top 10 Washing Machines that are worth it! Check them out and let me know what you think. 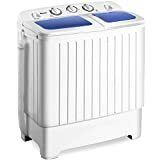 If you are looking for a budget compact twin tub washing machine, consider the Giantex Portable Washing Machine that comes top in our list. It the perfect relieve when you just can’t put up with all the laundry. It is compact and portable making it the best option for apartments, dorms, condos, motorhomes and much more. Giving you a whopping 300W of washing power and 110W of spinning power, this unit will take care of all your laundry needs. The washing timer lasts for 15 minutes per load and the spin dryer takes about 5 minutes. Talk of capacity, this unit’s washing capacity stands at 11lbs and the dryer at 6.6lbs. This implies you will be spinning at least twice per washing load. Despite featuring a compact, lightweight, and thin design, this unit boasts a powerful motor. The filter net fitted on the side of this top-load twin tub washing machine collects all the dirt when washing. The 11lbs capacity Panda Washing Machine is another amazing unit that will change the way you handle laundry. Boasting a space-saving design, this unit works amazingly when used in dorms, RVs, apartment or vacation home. Most impressive is the 1.6cu.ft capacity that will handle cloths of up to 11lbs. Easy to operate control panel and the transparent lid that allows you to see the clothes inside makes Panda a functional and friendly washing machine. It is portable can be used anywhere provided there is a 110V source of power. Kindly note that this unit has only one inlet that is compatible with standard faucets. Your work is made easier by the fact that the package includes the quick adapter and the inlet hose. Plus this unit features a durable stainless steel drum that resists chipping, corrosion and rusting. If hand washing is not your thing, you can relief your hands by letting the Giantex Portable Washing Machine occupy a small space in your store. It is a great unit that lets you program how you want your washing done and concentrate on other things. With 5 programs to choose from, you choose what you want using the wash push-button and have everything under control. With the honeycomb-shaped tub, you can load up to 8lbs of clothes and do as many cycles as you wish. Built-in aluminium pump and the drainage tube lets you drain out the dirty water in your dorm or apartment. It is pretty simple to operate and doesn’t require a plumber during installation. Coming in a portable lightweight design, this portable washing machine is another top-favourite model that will simplify your laundry work. It is a twin tub washing machine whose wash cycle runs for 15 minutes and the spin cycle lasts 5 minutes. The washer has a capacity of 3.6kgs and the spinner 2kg, which are adequate for medium laundry needs. Using this model is pretty simple, you simply add water, detergents and your clothes and set the machine to wash. Afterwards, you set the spin cycle to run so as to dry your clothes. The most impressive aspect of this machine is the fact that its space-saving nature allows it to be used in the smallest of spaces, even in a caravan. 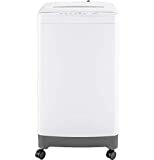 If you are tired of hand-washing why not try the DELLA Compact and Portable Washing Machine that lets you put in clothes, fill in water and set the machine to wash. It is simply to operate and features a clear lid that allows users to watch the wash cycles. The timer controls run the washing machine for 15 minutes and the spin can run for 5 minutes. One impressive aspect of this machine is the dual function that allows both the washer and the spin dryer to run at the same time. It is portable can be loaded with 11lbs of clothes. Even though Della is not a fully automatic machine, it is a great choice for dorms, apartments, motorhomes, RVs and much more. If you are after excellent results, I would recommend the Semi-Automatic Twin Tub ROVSUN Washing Machine. 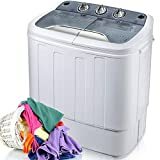 With a capacity of 13.4lbs, this unit lets you fill in loads of clothes and enjoy the smell of well-cleaned dry clothes in a matter of minutes. Equipped with a powerful 1300RPM Motor, this unit will exceed your laundry expectations. Despite boasting unmatched performance, this unit is compact and can be put in a very compact space, even in a caravan. The first-grade stainless steel and Plastic construction are pretty durable. It is energy-efficient and boasts a quiet operation. Cut down on energy and water bills while saving time with the Twin Tub Portable Washing Machine by Merax. 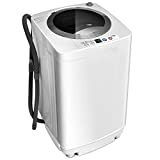 Delivering a powerful yet quiet performance, this portable washing machine is the perfect companion when you want to multitask while saving on resources. Just like other models, it is a twin tub with one part for washing and the other for spin drying. Despite featuring a compact and portable design, this unit has 8lbs washing capacity and 5lbs of spin. On a normal or soft wash, the wash cycle will run for 15 minutes and the spin cycle 5 minutes. Usage is a breeze, even a granny will comfortably operate this washing machine. You simply add clothes, water, and your detergent then set the machine to wash. Every single required in the setup is included. There is no assembly required. For a multifunctional all-rounder washing machine, Zenstyle surely steals the show. 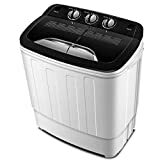 This amazingly built washing machine boasts a load capacity of 10lbs and will let you customize your laundry experience with 10 programs in combination with 8 water levels. Plus, the child lock functions shut the buttons and will set the error alarms running when prompted. Equipped with a powerful 13000RPM and a frequency of 60Hz, nothing will prevent you from washing as many clothes as you wish. Despite standing the test of time, this washing machine is compact and lightweight enough to occupy any small space. Plus, it is pretty simple and convenient to handle during a transition. Built-in drainage pump and pipe drain away dirty water while the transparent lid lets you monitor the washing clearly. This is another outstanding model from the Popular Giantex. With ten programs and eight water levels not to mention the child lock function, this unit is one of the best laundry washers out there. Despite being compact and ultra-portable, this unit boasts a honeycomb shaped tub that can load up to 10lbs. The unique combination of the delay function, easy to use control panel and the automatic imbalance adjustment makes this laundry unit a must-have. Transparent lid lets you monitor the washing cycle. In case of an error or child lock, the error alarm notifies the user. Washing your clothes has never been made easier, try out Giantex Portable Laundry Washer. Last but not least is the high-end Haier Portable Washing Machine that is known for its solid performance and long-term durability. The top-load portable washer boasts a 2.1cu.ft wash basket capacity and can be moved to anywhere anytime. Versatility is well expressed in the LED display that lets you choose from the 8 different wash cycles. One of the most adorable aspects of this washer is the adjustable levelling feet that enhances stability and optimizes functionality when this unit is used on the uneven surface. Transparent lid lets you monitor the progress of the cycles. Other items included in the package include the drain hoses, caster kit, and the dual cold/hot inlet valve. Washing machines can become a fixture of your family’s daily routine; they are convenient, efficient and can save money in the long run. Picking the right washing machine for you requires some careful research, since there are so many options available to consumers currently. The three most important factors are price, energy efficiency and washing performance. Price and energy efficiency go hand in hand, with better efficiency lending itself to being a better long-term investment. Load capacity, vibration, noise, and any extra features are also things to consider when considering your purchase. Most washing machines become a permanent fixture in your home, stuck in a corner of your laundry room or basement. However, the Panda XPB36 is extremely portable, weighing only 28 pounds. It is easy to operate, requiring you to simply fill with water and set a dial timer. It has two separate sections, one for washing with a 7 lbs capacity and the other for spin drying with a 3.5 lbs capacity. This is the perfect option for RVs, apartments, dormitories, or for road trips. Speed Queen AWN432S- The American-built Speed Queen AWN432S is a fully featured, top load washer. It has a 3.3 cubic ft load capacity, 17 different wash cycles, and 2 wash speeds. It uses a simple rotary dial for controls. Compared to most other washing machines, it is very quiet. This is a big positive if you plan on putting it near your living room. It has a 473/710 rpm spin speed with its 1/2 HP motor. This machine will function effectively over the long-term guaranteed. 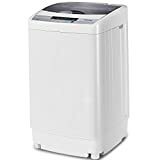 Panda XPB45 Portable Washing Machine – Like the XPB36 by Panda, this is also a portable washing machine weighing only 38.6 lbs. This deluxe portable model is great if you’re looking for something a little bit larger. It has a 10 lbs washing capacity and 6.6 lbs spin dryer capacity. It comes equipped with a twin-tub washer, which requires some manual filling prior to washing. It has 3 dials for selecting the wash timer, wash load, and spin timer. This is a great option that is suitable for RVs, caravans, short trips, picnics, condos or apartments. Haier HLP21N – This Haier model is a slightly higher-end portable washing machine with a couple extra features. It has a stainless-steel tub with up to a 6 lbs load capacity. With 3 water level and 3 wash cycle settings, it supports a fair amount of option. The top-loader has a transparent, non-locking lid that you can open at any time without harming the washing process. It comes with intuitive electronic controls, LED indicators, end-of-cycle signal, and an adjustable levelling leg. It measures approximately 17-1/4 by 17-3/5 by 30 inches and comes with an easy installation quick-connect sink adapter. This is a good option if you’re looking for a portable washer with a bit more power behind it. 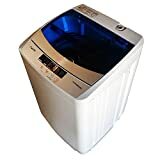 Midea MAE50 – The Midea MAE50 is another option you have if you’re looking for a medium sized portable washer. It has a sleek stainless steel design and has rollers on the bottom for easy transportation. It has intuitive touch controls for 6 selection programs along with LED indicators. After washing in its 36 x 22 x 21 inch tub, it includes a spin cycle to help drain water. For automatic water filling, you can run it off a kitchen sink faucet with a Y splitter. This results in a very quiet, convenient washing process. Samsung DV56H9100GW 9.5 Cu – This fully sized Samsung washing machine comes stocked with features. It has 15 wash cycles, 13 selectable options, 5 temperature settings, 5 spin settings and 5 soil settings. It comes with 4 dispenser trays for prewash, main wash, softener and bleach. Using steam washing and PowerFoam technology, it is very effective at cleaning many types of fabrics. Its Super Speed option can wash a full load in just 36 minutes. This is an excellent option if you’re looking for machine that can anything your family may throw at it. LG Graphite WM8000HVA – This LG Graphite is a powerful, high tech combo washer/dryer. It is larger than average, allowing it to handle larger loads. It features a TurboWash technology as well as TrueSteam technology and ColdWash options. These technologies will ensure that your clothes come out fresher and cleaner. It can handle 5.2 cu. ft. in its washer, and up to 9 cu. ft. in its mega capacity dryer. For extra storage, it also comes with 2 drawer pedestals. The dial and touch controls on both the washer and dryer are intuitive and easy to understand. The LG Graphite is a very quiet and effective washer that will save a ton of time for your family. Speed Queen AWN432 – The top loading Speed Queen AWN432 is similar to the AWN432S, except it is equipped with more power. It has a 3.3 cu. ft. capacity, and 2 wash speeds. It has 473/710 rpm spin speed with its 1/2 hp motor. Unlike the previous model, it has 20 wash cycles instead of 17. It also comes with a free 10 year manufacturer’s warranty on all major components. This washing machine is a good investment that will last for years and prove its worth daily. What is also important is that it doesn’t have any unnecessary digital controls, so there is no chance for any error codes or unforeseen malfunctions. General Electric GTWN5650FWS – General Electric’s GTWN5650FWS is a powerful top loading model with many options. It has 20 wash cycles, 6 different temperature settings, as well as 5 wash and spin speed combinations. Helping to save money, it has an energy saving option. The 700 rpm spin speed washer is very quick. Furthermore, it comes with a PreciseFill Sensor technology to help fill water more efficiently. The panel and dials are very easy to understand and use. This is a perfect appliance if you’re looking for a more permanent fixture in your home. 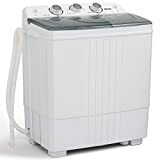 EdgeStar CWD1510S – The EdgeStar CWD1510S is a modern addition to any home looking for a high capacity combo washer/dryer. It has a 15 lbs wash capacity, and 7.71 lbs dry capacity. It features 7 wash cycles, 3 wash/rinse temperatures and 5 spin speeds. At its max, it can reach 1200 rpm spin speed, which can also be adjusted. Another cool feature is its self-clean setting, which saves a lot of time for something that many would otherwise forgo. It has a ventless FastDry drying technology, built-in water heater, and polyurethane tub construction. In the market for a new washer? If you are in search for the best washing machines for your home, then you may want to check out these options that will make it much easier for you to shop for the right one you need. Here are ten of the finest brands and models of washing machines in 2014 that may be worth your investment. Worried about a cramped floor space in your condominium unit or apartment? If so, then a portable washer is just what you need. The best thing about this product is its portable and compact features, as well as several features that add to your satisfaction in keeping your garments fresh and clean. For a large family, this washing machine with 10 kg capacity by Fisher & Paykel is an excellent choice. It has a 4-star rating for energy efficiency, and it features an advanced SmartDrive technology that lets you adjust the wash cycle depending on your preference. Hence, you can cut down on electricity and water each time you load the machine. Additional features of this unit include the allergy cycle, quick wash and easy iron. A growing number of customers are fond of the washing machine brand Fisher & Paykel because of its silent operation, economical value and durability. With its excellent capacity of 7 kg, this machine is suitable for families. This product also has a fast spin feature with a speed that goes to a maximum of 1000 RPM, which minimizes the time spent on drying clothes. Lastly, the machine comes with a delay-start option that lets you maximize energy rates on off-peak times. This is a reliable machine that offers a number of features for your convenience such as 6 different cycles for drying, 9 cycles for washing and a unique direct-drive motor that can make the job done easily. It also operates silently, so you can enjoy reading a book and not worry about excessive noise as you wash your clothes. Rely only on the best brand of washing machine in the market. This well-built machine offers an outstanding water efficiency feature, and it lets you wash several clothes at once because of its great capacity. When it comes to safety, this product has a remarkable flood protection component and pump protection to lessen your worries. What’s more, you can count of this machine to rapidly remove dirt and debris, so your clothes remain clean and fresh-smelling. This brand of top load washer by Samsung comes with a 5-step cleaning and washing system, which also helps reduces wear and tear on clothes. You will also appreciate the mist shower feature that dissolves detergent better to facilitate the machine’s capability to clean your clothes better. Lastly, the air turbo drying feature comes with superb drying power to make your clothes dry at a much faster rate. Busy families will find this machine quite ideal for their needs because of its high quality and unique components that can make your clothes cleaner easily. The Bubble Wash technology mimics the effects that a hot wash offers while utilizing the benefits of cold water. It also has a bright LED display that presents the washers multiple features. This way, you can choose the correct setting for washing your clothes in as little amount of time as possible. 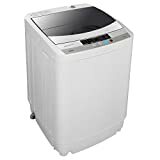 If what you need is a durable, economical and user-friendly washing machine with a large capacity, then this product is for you. It boasts of its astounding 4.5 WELS-star rating, which means this appliance can significantly cut down your water bill. It also operates quietly, so you will not have to worry about the unit being a disturbance to anyone in your household. With this machine, you can only expect the finest result on your clothes because of its advanced technology and efficient features. You can count on this product to help you save more time, energy and money because of various features such as the time manager, Jetsystem, and its energy-efficient quality. This product is just what you need when you look for convenience and high quality in a washing machine. This machine takes the stress out in keeping your clothes stain-free and completely clean. It comes with 15 different wash settings that add to your satisfaction and convenience in washing your garments. You can also adjust various options in the machine such as the drum rotation, soaking times and wash temperature. This machine is certainly a perfect fit for individuals with a busy lifestyle who want to get things done efficiently.